Record Store Visit: Kim's Video & Music - New York, NY - 11/21/12, a photo by Tim PopKid on Flickr. Place. A hell of a store that I miss. It started out with Kim's Underground on Bleecker Street being the go to location. Then after a while they got a huge space on St. Mark's Place and became Mondo Kim's. Mondo Kims was 3 floors of wonderful chaos. 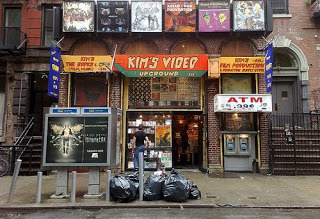 CD's, Vinyl, DVD's, crazy import movies and their infamous VHS rental business that housed some of the most insane movies ever created, The fate of Kim's rental business has been well documented on countless websites, but since I didn't live in NYC, I never was a member. I can tell you that I bought an awful lot of music at the old locations and even purchased my first region free DVD player there so I could buy more British comedy DVD's. Lot's of great memories over the years. Current Kim's is still a pretty great store. Not as big, but just as good, particularly their video section. Awesome imports, wacky exploitation movies...if it's weird, it's at Kim's. For me, Kim's was the only other location where I actually bought a record during this outing as I picked up a used Heavy Vegetable 7". All in all, not a particularly impressive haul for the day, but I was purposefully trying to spend as little as possible with the holidays coming up and all. This will wrap up my week long record store discussion here on the website. I hope you enjoyed it, but if not, no worries, it'll be back to records on Monday. I have thoroughly enjoyed writing about all of these stores, missing closed down shops, hunting for picture of the places I spend my formative years. It all makes me a bit sad, truthfully. But I do take solace in the fact that there are a handful of stores still trying to keep the record shopping experience alive in New York City, because I'll be damned if I'm going to go all the way to Brooklyn just to buy some records. Bangers / What-A-Night's - Split 7"
Low Culture - Georgia 7"
The Odd Numbers - Holiday 7" & The Easy Life 7"
Zebrassieres/ Funfuns - Split 12"
Pluto - Failure 7" & Deathstar 7"